雀鳥眼中的世界到底是怎麼樣的呢？科技的進步令我們可以把攝錄機安裝在遙控飛機模型上，以雀鳥的視覺去看風景，而且玩具級四軸飛行器的普及，讓我們可以用低廉的價錢去體驗航拍這玩意。Do you want to know how the birds see the world. Must be a very good view. Technology advancement let us put camera on remote control flyings models so we can see what the bird see. Toy grade quadrocopters make aerial videography affordable that everyone can experience it. 遙控多軸飛行器是繼遙控飛機及遙控直升機，另一種熱門航空模型，透過控制多個獨立馬達去達至移動，其中以四軸尤其流行。玩具級四軸飛行器的飛行穩定性，載重及功能當然不能與興趣級的航空模型相提並論，但作為入門選擇，其簡單之操作，價格定位之吸引，是普羅大眾的首選。RC multimotors models is becoming a popular option among flying models. Especially quadrocopters, by controlling multiple indenpendent motors it achieves movements and stable flying. 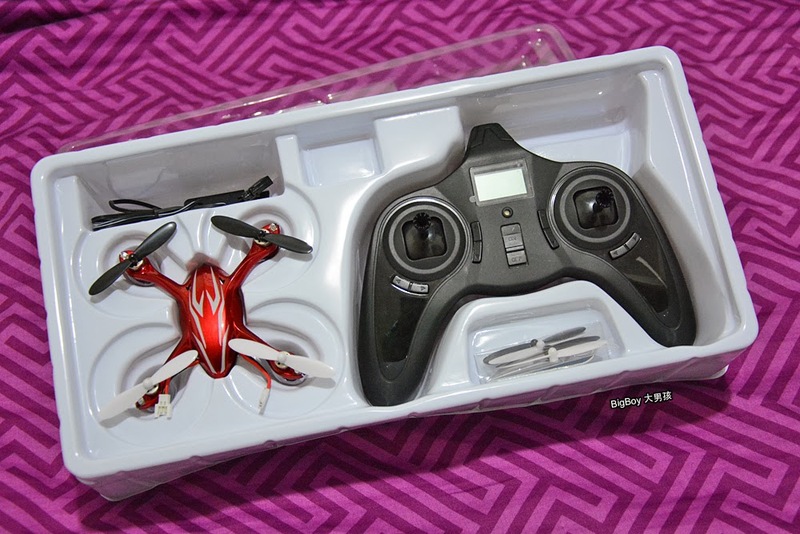 It is totally not comparable to any hobby grade models but as a entry level option, it is easy to control, price right and can be a nice training quad for newbies like me. 如果使用得宜，其實都可以拍攝到一些有趣影片，以下的一段影片，是節錄了一些大男孩剛開始玩四軸的片段，其中有一些畫面使用了YouTube的穩定功能。This video was shot right after I can control this micro quad. I am amazed that the video editing function of Youtube worked very well. The stabilization function works too. 今天要說的是玩具級別的四軸飛行器，如果以相機界的定位來看，大約就等於卡片數碼相機，一般都是以套裝形式發售，不能更換零件，尺寸比較細的遙控模型，價格大部分都在1000元以下。Toy grade multimotors flying models are just like compact digital camera in camera industry. 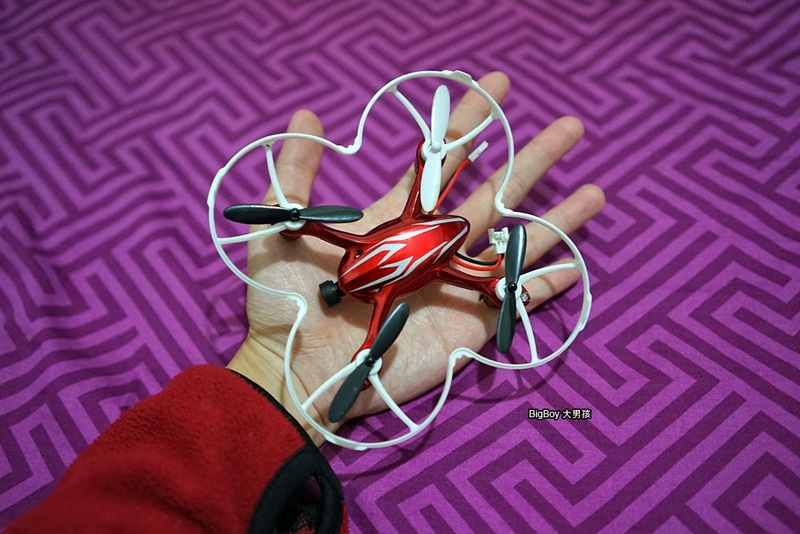 It comes with RTF (Ready to fly) package, no real parts can be upgraded, small in size and price are usually below HK$1,000. 這部Hubsan出品的X4系列，型號為H107C，是這個系列的中階型號。入門型號H107L沒有拍攝功能，H107C具備影片攝錄功能，高階型號H107D具備第一身視角（FPV）加錄影功能。而H107C亦有分高清（1280x720）及標清（640x480）錄影兩個版本，亦是X4系列唯一提供高清錄影的型號。鏡頭及錄影模組就藏在機身內，設計非常一體化。H107C sits right in the middle of the Hubsan X4 family. Entry level quad H107L does not provide video recording function. H107C can shoot videos and H107D, as the top of the line can shoot and feed video to the transmitter screen real-time (FPV). Pay attention there are 2 version of H107C, 1 comes with a SD camera that shoot 640x480 video. While the HD version, the version that I have can shoot HD video 1280x720. HD version of H107C is also the only X4 quad that can shoot HD video. camera and lens are enclosed inside the case so it has a very streamline look. H107C的可愛之處就是內藏錄影功能的同時，機身依然保持輕巧，大概一隻手掌大，而且可以安裝螺旋槳保護器，即使在室內也能享受飛行樂趣。Even though it can shoot nice video, it is still very compact in size. 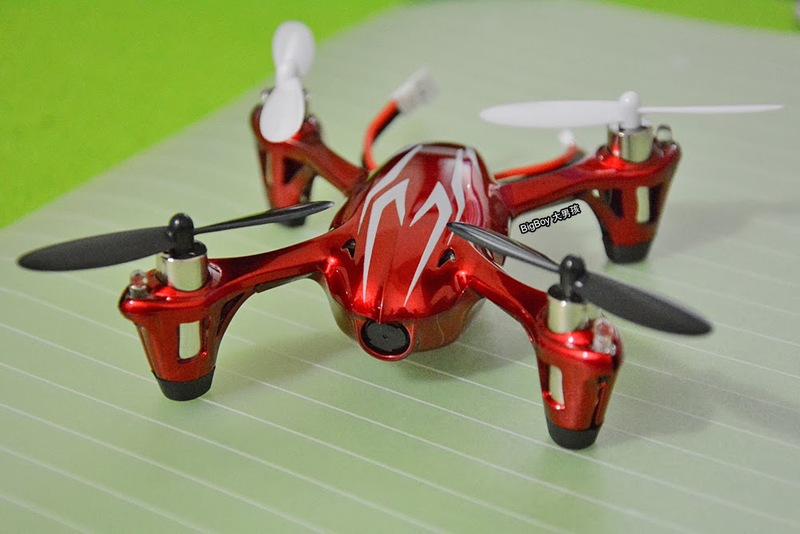 A palm size quad comes with a propeller protector makes it a perfect quad to fly at home. 這部遙控模型使用充電池供電，聲稱能連續飛行7分鐘，但實測飛行加錄影時間為4分鐘左右。飛行時間跟飛行習慣不無關係，速度及方向變化越多，電池消耗越快，所以不妨多備些電池。另外，為電池充電也是門學問，有好多東西要注意，充不好也會影響電池壽命。螺旋槳算是飛行器的唯一虛耗品，撞牆，墜落等意外會造成螺旋槳損壞繼而影響飛行穩定性，多準備幾對是有必要的，而且可以襯色。電池跟螺旋槳一樣都是20多30元的配件，消費不高，壞掉就更換吧。It takes rechargeable Li-po battery to power the motors. Official flight duration is 7mins. My experience is flying and recording video at the same time give me a 4min flight. You faster you move the sticks the shorter the flight time. So be prepare to stock in more spare batteries.Charging the batteries is important point as well. The original charger seems will overcharge the battery. May be this is the reason I got 4 mins flight only. The propellers tends to wear out over time, especially after crashes. Do buy some spare props and you can play with colors combination as well. 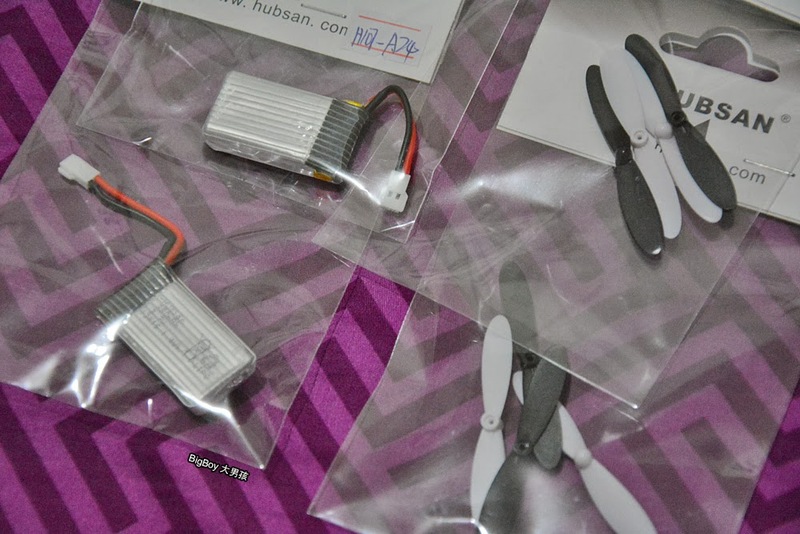 The batteries and props costs something like HK$20-30. It is quite reasonably priced. 要熟習這部迷你四軸其實不難，只需要照著說明書進行校對，內置的陀螺儀會保持飛行器水平飛行，於室內飛行姿態還是蠻穩定的。由於沒有任何自動定位功能，您要不斷調整油門及方向，去達至懸浮姿態。但當走到室外放飛就完全是另一個世界，由於機身輕，馬達轉速慢，於室外飛行非常容易受到風的影響，輕微的風吹草動都會導致它水平偏移，風大的日子更會使操控非常困難，尺寸小也令它很容易飛掉。而且經常隨風修正方向角度也會使錄影出來的影片非常抖動，所以還是建議於微風日子放飛。Learning how to fly this quad is not difficult. The gyro system keeps it level so flying indoor is very stable. It is a full manual quad with no position hold function at all so you need to constantly adjust the throttle and pitch control to keep it hover. Flying outdoor is a complete different story. It is light and the motor speed is slow, it tends to drift with wind. It becomes difficult to keep a stable flight in windy day and since it is small you risk loosing it too. Flying with wind means you will constantly adjusting the pitch and that will make the recorded video not useable. So for me, it is a quad for indoor and clam day outdoor. 官方聲稱遙控距離有100米，如果位於開揚的戶外環境，實測50米左右是沒有問題，但去到這麼遠已經很難看到它的形態，要處理前後左右方向是個很大的挑戰，由於沒有第一身視角功能，進行遠飛是既有難道，又俱危險性。Range is claimed to be 100 meters. I can go as far as 50 meters if there is open space. You can hardly see the quad and you loss orientation too so it is dangerous to fly it far away from you. 內置攝錄機能錄影1280x720像素的影片，全自動，光圈，快門，白平衡，ISO，甚麼也不能設定，控制開始及停止錄影的按鈕在飛行器機身上，意味著您不能夠透過遙控器控制錄影開關。短片壓縮率算是中規中矩，不至於起格，但也談不上充滿細節，自動白平衡效果一般，尤其是面對以綠色為主的畫面，你會希望可以自行選擇白平衡設定，但價值500元的玩具實在不能要求這麼多了，我對比過其他品牌差不多價位的玩具級四軸飛行器，H107C HD版本的攝錄質素算是最好的。The built-in camera shoot 1280x720 video. It is a full auto. Neither aperture, shutter speed, white balance nor ISO can be adjusted. The start/stop recording button is location in the quad that means you are not able to control recording through the transmitter. Video quality is ok, comes with some noise but perfectly useable. 1 compliant from me is the auto white balance. It doesn't work well when it faces scene with green as the main color. It has problem handle a right color outcome. But may be I cannot expect too much from a quad that cost HK$500 only :) I compared the video quality of a few toy grade quad, it turns out H107C produce the best video quality. 由於電視節目效應的關係，越來越多人像大男孩一樣對航拍產生興趣，在決定購買具備GPS/指南針定位等功能的興趣級飛行器前，一部迷你小四軸可以充當訓練機，把基本功練好，是不錯的選擇。而且它體積細，基本上可以日日玩，但不要對其表現有過分的期望。另外，飛行時間短的確有待改善，而且內部零件沒有用上插頭式設計，萬一零件損壞要更換時就比較麻煩。Before buying more expensive quad with GPS/compass function it is good to have a micro quad to train up the skills. I can play it everyday due to the small size of it. I hope the flight time can be extended so more fun too. Luckily this little monster seems very durable it survives crashes but I found that all the cables are connected by soldering. I am not god at that so it anything break I may need to ask for help to reconnects cables. 1）拍攝時盡量使用低馬達轉速，輕給油門，減少高速旋轉時造成的震動。雖然上升速度會比較慢，但影片會比較穩定。Do not use hard throttle. Motors rotate faster means more virbration created for the video. Just let it climb slow. 2）如非必要，拍攝時不要使用左右傾斜飛行，因為這正會造成影片畫面明顯抖動。飛行器飛行時並不會直上直落，無風環境下仍然輕微水平偏移是正常的，不需要過分修正。Avoid using left/right pitch control while shooting. It creates shakes in the video. The quad will not go up and down straigthly, it will drift. Do not over correct it and just let it be. 3）使用偏移補償去代替前進/後退方向控制。為了修正陀螺儀的偏差，遙控器上有對前後，左右及旋轉偏移作補償的按鈕，當發現飛行器向一邊偏移飛行時，調較補償按鈕去減少偏移。透過大幅度調較偏移補償，例如多次按下向前的補償按鈕，飛行控制器會以為飛行器嚴重向後偏移，自動增加向前飛行的動力，這就等於在沒有推動方向控制桿的情況下自動以固定速度向前飛行，非常適合拍攝影片。use elevator trim to replace elevator control. The trims are for compensating drifting. But you can fool the flight controller by pressing forward elevator trim to make it drift forward. Drifting speed is very stable for video. 4）避免背光拍攝，內置攝錄機不像您的數碼相機，它不能處理複雜光線，背光拍攝將會令您非常失望。Avoid shooting back-lit scene. The built-in camera is no way near digital camera and it just cannot handle back-lit scene. 5）預先計劃好想拍攝的畫面，然後進行短途飛行拍攝後立即降落，重複多次，回家於電腦選擇最穩定的片段。Plan what you want to shoot. Try a few times and keep it short. Select the best when reviewing on computer.